People love to bargain shop because it gives them twice the pleasure and as little as possible of the pain of having to pay. The bigger the discount, the better the feeling. However there’s a down side to this philosophy: the discounted stuff available isn’t always the one that’s most desired. But this isn’t case with Mighty Deals, where web developers everywhere can save from 50% to 90% off on things like design tools (royalty-free vectors, PhotoShop actions, etc. ), professional templates (WordPress, Drupal, Facebook), Mac toolkits, web development lessons and more. Here you only have the pleasure of finding some of the sweetest deals around. If this got your curiosity, the Themes Deals will definitely get your attention, because here you’ll find all sorts of themes and templates for a lot less than you’d normally pay for a single similar premium product from many sites. For a limited time only you can get 20 templates normally sold for $700, for just $19! That’s an insane savings of 97%! And this is only one example, but you can find some of these deals below. Creativo: A Responsive WordPress Theme – only $17! You could spend days digging through various WP templates and plugins. 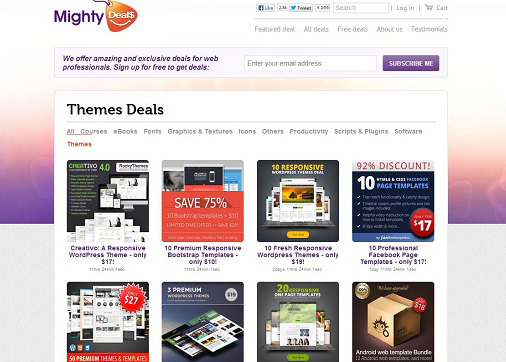 Or you could just jump on this incredibly unbelievable Mighty Deal from RockyThemes and get them all at once. The Creativo 4.0 theme is built with a super responsive design which means that no matter what device your users are visiting your website on (smartphone, iPad, desktop, laptop), your site will always look and function perfectly. If you’re real entrepreneur, you’ll be glad to hear that Creativo is fully compatible with WooCommerce, so you can easily sell your own products by creating a WooCommerce shop inside of the Creativo theme. DXThemes: 50+ WP Themes and Responsive Templates – only $27! Wouldn’t it be great if you could just have a mammoth library of your own filled with dozens of quality HTML5 templates to browser through and use anywhere and everywhere you’d like? Yes it would. That’s why this Mighty Deal from DXthemes offers you a chance to get 22 different WordPress themes and 32 high-quality responsive HTML5 Templates. The deal includes a commercial license for all templates and themes, so you can use them on your own personal website or any of your client’s sites. And there’s absolutely no limit to the number of sites you can use these on. MEGA Android Bundle: Templates, Icons & more – only $18! Everyone knows building a website can take time and loads of money. Good thing you’ve got Mighty Deals on your side! This Android Web Template Bundle from IconNice features 13 unique templates for one low price! Each template doesn’t just include one page or layout. The downloads feature several layout options such as background, portrait iPhone, iPad, image carousel and more. You’ll also get all necessary PSD design files with each template, as well as EPS files. That makes it easy to customize the page with your own images or logos. Rather than spending tons of money getting a completely custom design for your new web project, why not grab this bundle of 15 iPhone and iPad web templates from ICONNICE. You also get a set of 192 vector icons (in EPS and PSD formats) and a PSD template for a promotional website. The entire bundle is only $24 through this deal, a discount of 85% off the regular price of $160. It’s less than you’d normally pay for a single premium template from many sites. 20 One-Page Responsive Templates with Parallax Effect – only $19! This Mighty Deal from Flashmint lets you get in on the fun with 20 HTML5 one-page Website templates with the Parallax Effect! This bundle features 20 high-quality, professional HTML/CSS templates for your website (note: These are not WordPress templates, but website ones). You’re sure to find a design and layout you like among so many great choices. The purchase of this Web Template Bundle means you’ll receive the necessary CSS, HTML and PSD files for each template. That makes it easy to customize your templates any way you’d like, from adjusting colors to adding images.